Which songs were heard in Mediaeval times among the Jewish communities? What were the melodies of Hebrew songs of the Golden Age in Spain? What were the sounds that accompanied the Jewish Diaspora as they went about their daily lives? What were the sounds of their joys, of their thoughts and of their laments? The sounds of silence serve as the background to these questions, as what we know is but the merest whisper of what existed. Except for three liturgical poems (Piyyutim) from Cairo in the 12th century, copied by Obadiah the Proselyte, there is no evidence for Hebrew texts with musical notation before the 16th century. Perhaps Hebrew manuscripts containing musical notation were lost during the catastrophes that befell the Jewish people? Or, perhaps the Hebrew musical culture was an oral tradition that was only rarely documented in writing? Did the scribes of Hebrew manuscripts know the musical notation? If they did not, this may be one explanation for the scarcity of Hebrew musical manuscripts. Since the destruction of the Temple in 70 CE, music in the Jewish culture, and in particular instrumental or secular music, has been a controversial issue. The prohibition on singing and playing music that Maimonides expressed back in the 12th century can help shed light on this phenomenon. When asked whether it is allowed to listen to the singing of the Muwashshah poetry when accompanied by instruments he replied: It is known that singing and playing instruments are all forbidden […] Everything that brings the joy and excitement of the soul is forbidden […] and if it is played on instruments hence there are three prohibitions: [the] prohibition of hearing foolishness, […] [the] prohibition of listening to singing, […] and [the] prohibition of listen to string instruments. And if wine drinking is involved hence there is a fourth prohibition […] And if the singing person is a woman hence there is a fifth prohibition […]. Reading this and other sources mentioning these prohibitions one can infer that the need to prohibit music inside and outside the walls of the synagogue was the result of the fact that Jews did indeed partake in musical activities. Jews studied the “wisdom of music”, others translated manuscripts dealing with music from Arab and European sources, and others studied music at universities from the great masters such as Marchetto da Padova. The project ‘Mizmor LeDavid – Early Hebrew Music’ poses these questions and wishes to give them new answers by looking at the meeting points between the Jewish culture and the cultures that surrounded it. The journey began with historical research of the musical examples and indications that did survive, along with thorough research of the Hebrew texts and poetry assisted by world-class literary scholars. The journey culminates in the public performance of the songs. 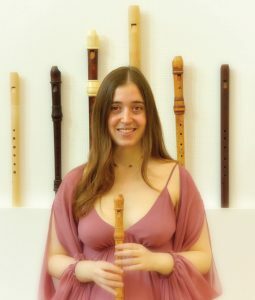 Ayelet Karni, an interdisciplinary musician plays recorders, historical oboes, shawms and other wind instruments. She has a Masters in Music of the Middle Ages and The Renaissance and a Masters in historical oboes from the Schola Cantorum in Basel, Switzerland, and a Bachelor of Arts from the Jerusalem Academy of Music. She has performed extensively across Europe, the U.S.A and Israel. In her performances she puts an emphasis on presenting the historical context of the works performed and communicating with her audience. Ayelet wrote her Master’s thesis on “The Hebrew Song in Mediaeval Europe”. Her search for Hebrew music from the Middle Ages is the result of her wish to learn about the musical history of the Jewish nation and bring her findings to large audiences. The project ‘Mizmor LeDavid – Early Hebrew Music’ combines research, lectures and musical performances.